Get a better understanding of microservice architecture and, as an example of its benefits, how Uber broke down their monolith into microservices. From my previous blog, you must have gotten a basic understanding of microservice architecture. In this blog, you will get into the depth of the architectural concepts and implement them using an Uber case study. You can refer to What is Microservices to understand the fundamentals and benefits of microservices. It will only be fair if I give you the definition of microservices. As such, there is no proper definition of microservices/microservice architecture, but you can say that it is a framework which consists of small, individually deployable services performing different operations. Microservices focus on a single business domain that can be implemented as fully independent deployable services and implement them on different technology stacks. Figure 1: Difference Between Monolithic and Microservice Architecture - Microservice Architecture. Refer to the diagram above to understand the difference between monolithic and microservice architecture. For a better understanding of differences between both the architectures, you can refer to my previous blog, What Is Microservices. To make you understand better, let me tell you some key concepts of microservice architecture. Before you start building your own applications using microservices, you need to be clear about the scope and functionalities of your application. Following are some guidelines to be followed while discussing microservices. As a developer, when you decide to build an application separate the domains and be clear with the functionalities. Each microservice you design shall concentrate only on one service of the application. Ensure that you have designed the application in such a way that each service is individually deployable. Make sure that the communication between microservices is done via a stateless server. 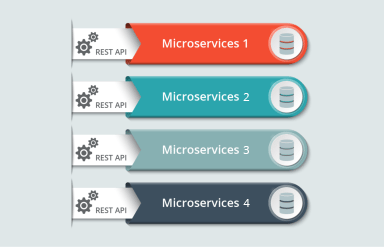 Each service can be furthered refactored into smaller services, having their own microservices. Now, that you have read through the basic guidelines while designing microservices, let's understand the architecture of microservices. How Does Microservice Architecture Work? Figure 2: Architecture Of Microservices - Microservice Architecture. I know the architecture looks a bit complex, but let me simplify it for you. The architecture starts with different types of clients, from different devices trying to perform various management capabilities such as search, build, configure etc. These requests from the clients are then passed on the identity providers who authenticate the requests of clients and communicate the requests to API Gateway. The requests are then communicated to the internal services via well-defined API Gateway. Since clients don’t call the services directly, API Gateway acts as an entry point for the clients to forward requests to appropriate microservices. All the services can be updated without the clients knowing. Services can also use messaging protocols that are not web-friendly. The API Gateway can perform cross-cutting functions such as providing security, load balancing etc. After receiving the requests of clients, the internal architecture consists of microservices which communicate with each other through messages to handle client requests. Asynchronous Messages: In the situation where clients do not wait for the responses from a service, microservices usually tend to use protocols such as AMQP, STOMP, MQTT.These protocols are used in this type of communication since the nature of messages is defined and these messages have to be interoperable between implementations. The next question that may come to your mind is how do the applications using microservices handle their data? Figure 3: Representation Of Microservices Handling Data – Microservice Architecture. The services provided by microservices are carried forward to any remote service which supports inter-process communication for different technology stacks. After the microservices communicate within themselves, they deploy the static content to a cloud-based storage service that can deliver them directly to the clients via Content Delivery Networks (CDNs). This component is responsible for balancing the services on nodes and identifying failures. Acts as a guide to microservices to find the route of communication between them as it maintains a list of services on which nodes are located. Now, let’s look into the pros and cons of this architecture to gain a better understanding of when to use this architecture. Let us understand more about microservices by comparing Uber previous architecture to the present one. Like many startups, Uber began its journey with a monolithic architecture built for a single offering in a single city. Having one codebase seemed cleaned at that time, and solved Uber's core business problems. However, as Uber started expanding worldwide they rigorously faced various problems with respect to scalability and continuous integration. Figure 4: Monolithic Architecture of Uber – Microservice Architecture. The above diagram depicts Uber's previous architecture. A REST API is present with which the passenger and driver connect. 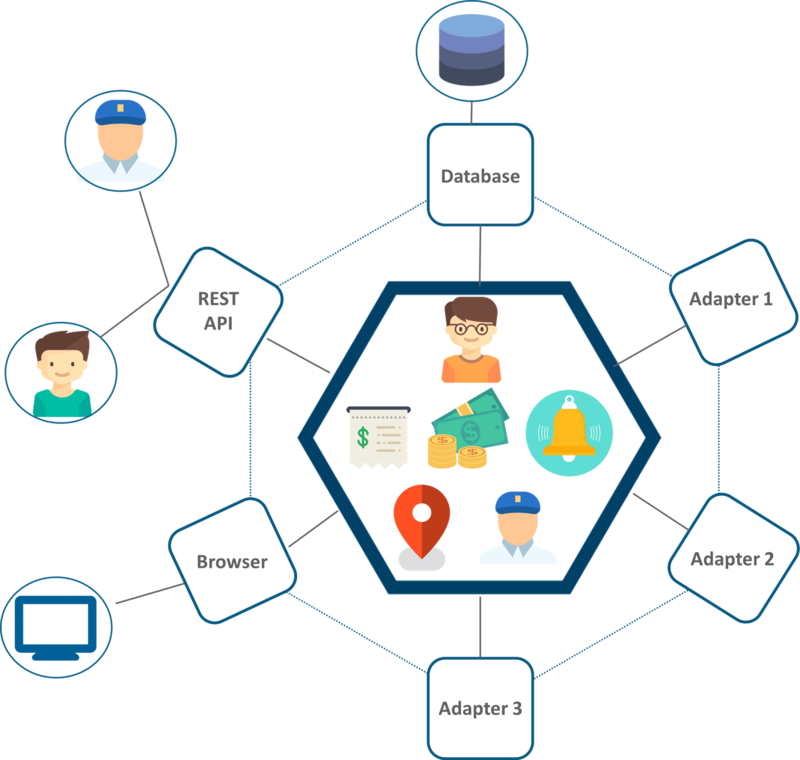 Three different adapters are used with API within them, to perform actions such as billing, payments, sending emails/messages that we see when we book a cab. A MySQL database to store all their data. So, if you notice here all the features such as passenger management, billing, notification features, payments, trip management and driver management were composed within a single framework. All the features had to be re-built, deployed and tested again and again to update a single feature. Fixing bugs became extremely difficult in a single repository as developers had to change the code again and again. Scaling the features simultaneously with the introduction of new features worldwide was quite tough to be handled together. To avoid such problems Uber decided to change its architecture and follow the other hyper-growth companies like Amazon, Netflix, Twitter and many others. Thus, Uber decided to break its monolithic architecture into multiple codebases to form a microservice architecture. Refer to the diagram below to look at Uber microservice architecture. Figure 5: Microservice Architecture of Uber – Microservice Architecture. The major change that we observe here is the introduction of API Gateway through which all the drivers and passengers are connected. 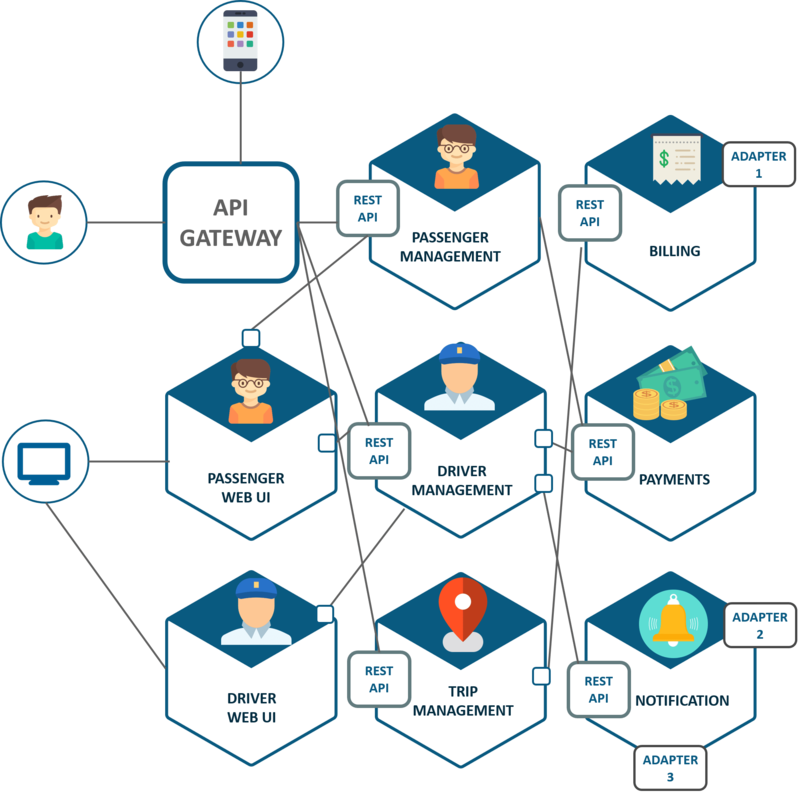 From the API Gateway, all the internal points are connected such as passenger management, driver management, trip management and others. The units are individual separate deployable units performing separate functionalities. For Example: If you want to change anything in the billing microservices, then you just have to deploy only billing microservices and don’t have to deploy the others. All the features were now scaled individually i.e. The interdependency between each and every feature was removed. For Example, we all know that the number of people searching for cabs is more comparatively more than the people actually booking a cab and making payments. This gets us an inference that the number of processes working on the passenger management microservice is more than the number of processes working on payments. In this way, Uber benefited by shifting its architecture from monolithic to microservices. I hope you have enjoyed reading this post on microservice architecture. I will be coming up with more blogs, which will contain hands-on as well.